While doing some light research on using Shopify on a possible project, I stumbled upon The Heads of State design guys in the Shopify showcase section. Their poster prowess makes me envious yet simultaneously full of design lust. The colours on the Wilco poster keep reminding me to push the concept of overlays to create colour harmonies. Buy the design goodness from the The Heads of State Poster Shop. I especially love their new Travel Series. I’m so freaking glad I made this. I used a packaged puff pastry base instead of making my own crust and it’s heavenly. I used this recipe from Epicurious as a base. Instead of Jack or Gruyere cheese, I used a strong Irish cheddar on the crust then microplaned parmesan on top. 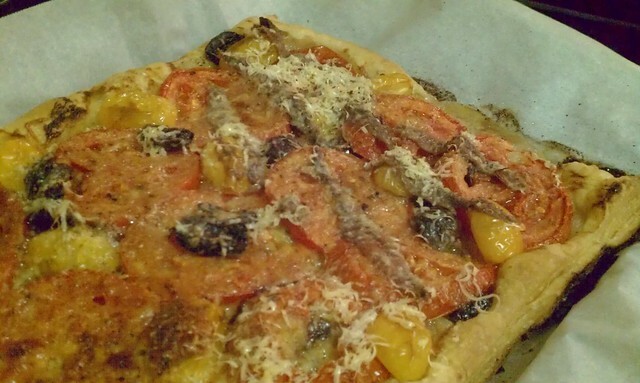 Next time, I may just leave out the anchovies altogether (only put them on half this time). I made this to use some of my extra CSA tomatoes from last week, but this didn’t use up nearly as many as I thought it would. Earlier in the afternoon, I also baked some chicken thighs seasoned with sage, garlic powder, salt, pepper, thyme and lime for snacking later on. Tomorrow I may sauté some peaches in butter and whiskey to put over some coconut milk ice cream. What are y’all making this weekend to weather out the storm? Wednesday was slightly less productive yet feeling good nonetheless. What about y’all? + Joined the planning committee of IACP’s (International Association of Culinary Professionals) conference for next year – Host City and the PR & Social Media committees. I’m going to try my hand at doing a daily recap of all things good and not so good that happened throughout my day. While even writing this, I had an epiphany that I wasn’t a huge slacker. Found $10 on the ground last night outside my housesitting place. Sweet. Dropped off a roll of film from my Portland, OR trip at the Lomography store for development, prints and digital cd. Only $16, sweet deal. And…I schooled another customer on how to use the light meter on his Canon AE-1, which my second camera during undergrad photo school. That was a huge boost of artistic confidence. Coworked at New Work City and helped a wee bit with the after-hours WordPress NYC Meetup. I’m a PT member at NWC, come find me sometime. Got social media schooled by Nichelle Stephens on some of her tools. Confirmed my conversion to Hootsuite from Tweetdeck especially for the Hootlet Chrome extension. Registered for the Brussels Startup Weekend, October 21. Designers, coders and UI folks prototype and build projects in a weekend. Excited! And I got the last designer early bird spot. Tried out Wooly’s Ice with Nichelle. This stuff is amazing. I had the sweet milk ice with brownies, strawberries and drizzled with sea salt condensed milk. 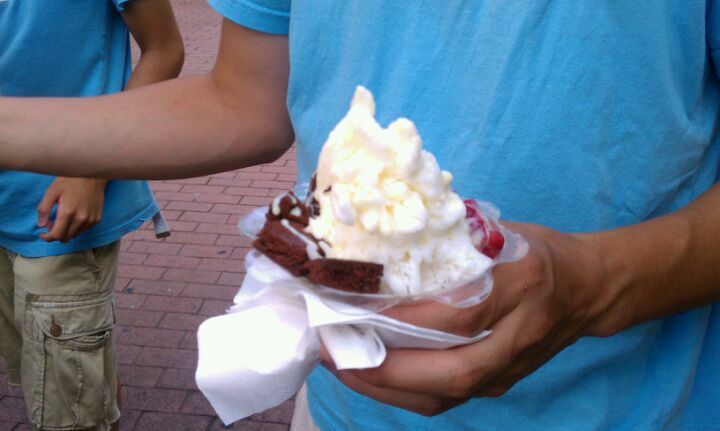 I had the sweet milk ice with brownies and strawberries. What new stuff are you trying this week? Last week Saturday I had the pleasure of moderating a panel during TECHMunch, a one-day conference about food blogging and all the subjects that fall underneath that. My panelmates were a wonderful and diverse group of content creators and publishers, ranging from individuals posting to a YouTube channel all the way to a Food Network exec. It was my first panel moderating experience and because of these great folks and the audience questions, I would love to do it again. Surprisingly, I wasn’t that nervous going into it. Win. After a long while, I finally have my blogging home set up the way I would like it to be. From now on, I’ll be blogging about design, events, food and design related travel. Immediately coming up will be my highlights from SXSW Interactive which I’m currently attending. There’s way too much information to process and this will be my way to distill.